Songwriter, multi-instrumentalist and music educator Harvey Reid has honed his craft since the 1970's in countless clubs, festivals, streetcorners, cafes, schools and concert halls across the nation. He has been called a "giant of the steel strings" and "one of the true treasures of American acoustic music," and is considered to be one of the modern masters and innovators of the acoustic guitar, autoharp and 6-string banjo. He has absorbed a vast repertoire of American contemporary and roots music and woven it into his own colorful, personal and distinctive style. His 32 recordings on Woodpecker Records showcase his mastery of many instruments and styles of acoustic music, from hip folk to slashing slide guitar blues to bluegrass, old-time, Celtic, ragtime, and even classical. Reid is also the author of dozens of music education books as well as an important visionary and pioneer in modern troubadour education. He is the creator of the Liberty Guitar Method, a ground-breaking advance in beginning guitar. Reid's skills and versatility on the guitar alone mark him as an important voice and one of the deepest artists in acoustic music. He won the 1981 National Fingerpicking Guitar Competition and the 1982 International Autoharp competition. Yet he's also a veteran musician with a long list of studio and band credits, a strong flatpicker who has won Bill Monroe's Beanblossom bluegrass guitar contest, a versatile and engaging singer, a powerful lyricist, prolific composer, arranger and songwriter, a solid mandolin, mandocello and bouzouki player, and a seasoned performer and captivating entertainer. Reid started playing guitar in his early teens in Maryland, and fell in with the now-legendary DC-area bluegrass scene. 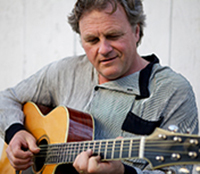 After street-fiddling and playing old-time and bluegrass music for close to 9 years, he moved into his van in the late 1970's and began pursuing solo acoustic songs & instrumental music, primarily fingerstyle acoustic guitar and autoharp. After stints in a bluegrass band in Colorado, playing electric guitar in a country band in Virginia, and a winter in Nashville, Reid migrated to Northern New England, playing 5 nights a week on the "blue-collar" folk circuit in Maine and New Hampshire, while developing his own personal blend of American acoustic music. Although Reid has been somewhat reclusive, his reputation as a musician's musician has spread far and wide. Even though he is not associated with any record labels or hype machinery--he was included on the Rhino Records Acoustic Music of the 90's CD, and his Steel Drivin' Man CD was voted by Acoustic Guitar Magazine as one of the Top 10 Folk CD's of All Time, in company with Woody Guthrie, Joan Baez and other hallowed names. His music appeared on the blockbuster BBC television series Billy Connolly's World Tour of Scotland. 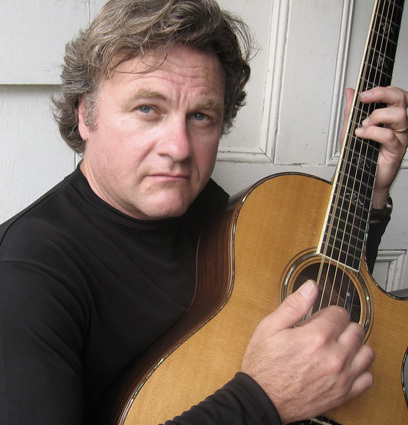 He has been a featured act at many of America's premier concert clubs and festivals, including Merlefest, the Newport Folk Festival, the Troubadour Folk Festival, the Telluride Bluegrass Festival and the Walnut Valley Festival. Radio DJ's and critics nationwide have discovered his remarkable recordings. Reid has also made his mark on the acoustic music world in other ways. He is responsible for most of what is known about the partial capo, developed all of the popular partial-capo configurations in use today, (including the Esus) was the first to record and publish music for partial capo. In 1980 he co-founded the Third Hand Capo Co. and wrote the first college textbook for folk guitar, titled Modern Folk Guitar, published by Random House. Reid probably published the first desktop-published book (in 1980) and likely was the first acoustic independent musician to release a CD. He was certainly was among the first to make all-digital recordings, and helped usher in the new era of "indie" recording with a series of articles he wrote for acoustic music magazines. He was also the first artist to endorse Taylor Guitars, and began doing promotion for them in 1983. Reid's success "under the radar" has become a role model for a large number of young, independent musicians who want to pursue their careers outside the music industry. Reid's ground-breaking new series of Capo Voodoo books and recordings are the definitive guides to the fascinating world of partial capos, and his unveiling of the Liberty guitar tuning in 2014 marks an important new discovery in the guitar fingerboard and a landmark in guitar education. Reid is currently finishing a very ambitious series of music education projects that now includes almost 30 books, including the definitive chord books for guitar, banjo, DADGAD tuning, Orkney tuning, octave mandolin, baritone ukulele and mandocello. Don't miss a chance to hear the Master Minstrel in concert or to hear his amazing recordings. He how has two young children, and is not traveling very much these days. He can often be found performing in York, Maine. "Reid is truly a giant of the steel strings...wonderful twists of originality and emotional depth... a wealth of techniques and ideas." GUITAR PLAYER MAGAZINE. "An incredible solo guitarist.... Reid plays mandolin, funky slide guitar blues, ethereal 12-string and scorching electric with equal authority; and the best part is, he's really fun."